Product Summary: COMP Cams and ProRacing Sim have teamed up to introduce the DeskTop Dyno5, an easy-to-use, engine-dyno simulation that offers amazing predictive accuracy and low cost of under $50 each. 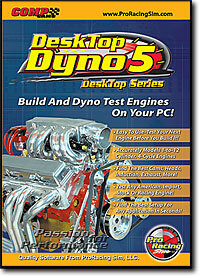 DeskTop Dyno5 allows any performance enthusiasts to test camshafts, cylinder heads, compression ratios, valve sizes, intake manifolds, fuels, nitrous oxide, exhaust systems and so much more! In seconds, you can enter your engine specs using our simple Direct-Click™ interface. Then watch the simulation display power and torque curves within a few percentage points of actual dyno data! Effortlessly test an unlimited range of part combinations. No other simulation software compares in cost, features and accuracy.